But I'd like to avail myself of a built-in or a more Pythonic idiom if possible. Related question: In Python, what is the fastest algorithm for removing duplicates from a list so that all elements are unique while preserving order? Why assign seen.add to seen_add instead of just calling seen.add? Python is a dynamic language, and resolving seen.add each iteration is more costly than resolving a local variable. seen.add could have changed between iterations, and the runtime isn't smart enough to rule that out. To play it safe, it has to check the object each time. O(1) insertion, deletion and member-check per operation. 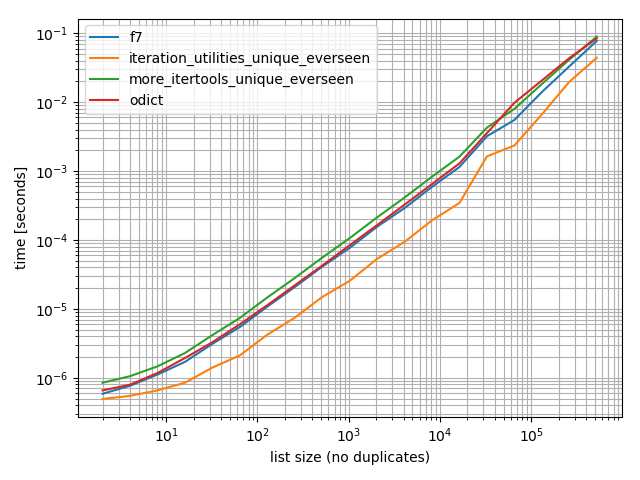 As Raymond pointed out, in python 3.5+ where OrderedDict is implemented in C, the list comprehension approach will be slower than OrderedDict (unless you actually need the list at the end - and even then, only if the input is very short). So the best solution for 3.5+ is OrderedDict. which relies on the fact that set.add is an in-place method that always returns None so not None evaluates to True. Note however that the hack solution is faster in raw speed though it has the same runtime complexity O(N). In Python 3.5, the OrderedDict has a C implementation. My timings show that this is now both the fastest and shortest of the various approaches for Python 3.5. Response to @max: Once you move to 3.6 or 3.7 and use the regular dict instead of OrderedDict, you can't really beat the performance in any other way. The dictionary is dense and readily converts to a list with almost no overhead. The target list is pre-sized to len(d) which saves all the resizes that occur in a list comprehension. Also, since the internal key list is dense, copying the pointers is about almost fast as a list copy. The list doesn't even have to be sorted, the sufficient condition is that equal values are grouped together. Edit: I assumed that "preserving order" implies that the list is actually ordered. If this is not the case, then the solution from MizardX is the right one. Community edit: This is however the most elegant way to "compress duplicate consecutive elements into a single element". Not to kick a dead horse (this question is very old and already has lots of good answers), but here is a solution using pandas that is quite fast in many circumstances and is dead simple to use. Handles a standard key function. Is it actually faster than f7? It depends on your data, so you'll have to test it and see. If you want a list in the end, f7 uses a listcomp, and there's no way to do that here. (You can directly append instead of yielding, or you can feed the generator into the list function, but neither one can be as fast as the LIST_APPEND inside a listcomp.) At any rate, usually, squeezing out a few microseconds is not going to be as important as having an easily-understandable, reusable, already-written function that doesn't require DSU when you want to decorate. As with all of the recipes, it's also available in more-iterools. 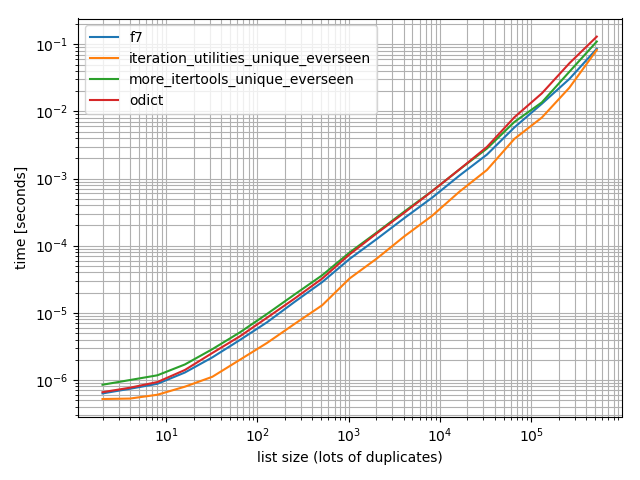 In all of these cases the iteration_utilities.unique_everseen function is the fastest (on my computer). This iteration_utilities.unique_everseen function can also handle unhashable values in the input (however with an O(n*n) performance instead of the O(n) performance when the values are hashable). In Python 3.7 and above, dictionaries are guaranteed to remember their key insertion order. The answer to this question summarizes the current state of affairs. I tried it for growing data sizes and saw sub-linear time-complexity (not definitive, but suggests this should be fine for normal data). MizardX's answer gives a good collection of multiple approaches. You can reference a list comprehension as it is being built by the symbol '_'. For example, the following function unique-ifies a list of elements without changing their order by referencing its list comprehension. You could do a sort of ugly list comprehension hack. A generator expression that uses the O(1) look up of a set to determine whether or not to include an element in the new list. this will preserve order and run in O(n) time. basically the idea is to create a hole wherever there is a duplicate found and sink it down to the bottom. makes use of a read and write pointer. whenever a duplicate is found only the read pointer advances and write pointer stays on the duplicate entry to overwrite it. text = "ask not what your country can do for you ask what you can do for your country"
This method is quadratic, because we have a linear lookup into the list for every element of the list (to that we have to add the cost of rearranging the list because of the del s). Not the answer you're looking for? Browse other questions tagged python list duplicates unique or ask your own question. In Python, what is the fastest algorithm for removing duplicates from a list so that all elements are unique *while preserving order*? How to delete duplicate values in a list? How can I remove duplicate tuples from a list based on index value of tuple while maintaining the order of tuple?